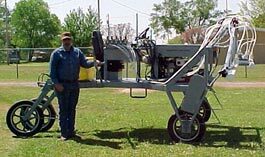 Manchester Manufacturing's new Weed Wiper is the perfect solution for eliminating nuisance weeds from your crops. We've specially designed the Weed Wiper to fit your needs. Weed Wiper works excellent on rye, weeds, Johnson grass or any growth above your crop to be harvested. Choose an air or Suspension seat for optimum comfort for those long days in the field. Additional options like the buggy top and radio further make your work even more comfortable. With hydraulically controlled front mount booms that raise and lower to the contour of the land, you have total control on chemical application. The application reservoir holds approximately eight gallons of chemical mixture total (Mix one part Roundup to four parts water (use distilled water)) to let you get more work done with less time spent mixing chemicals and maintenance. The built-in foam marker system allows you to save money by eliminating double coverage. Specially engineered narrow tires lower crop knockdown, and the 30" wheel spacing fits average rows for milo, beans, or cotton. The 21 HP engine provides ample power and the hydrostatic drive and steering allows total machine control.